I wrote a post a few years back on the difficulties that can ensue when you’re just trying to get started on your Lean Six Sigma or quality improvement initiative. It can become especially difficult when you have many potential projects staring at you, but you aren’t quite sure which one will give you the most bang for your buck. 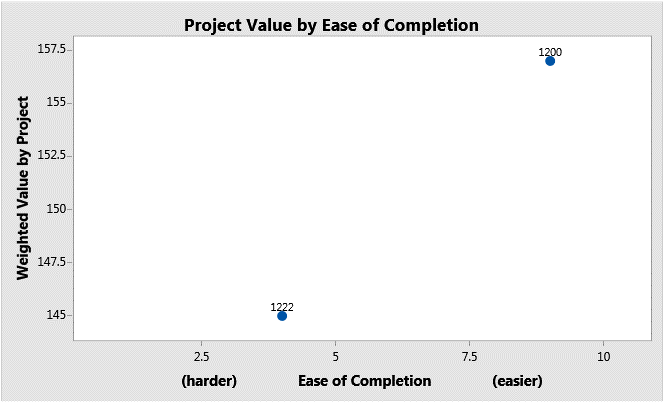 A project prioritization matrix can be a good place to start when you need to choose which projects to focus on, as it can help you logically select optimal improvement projects against their weighted value, based on your company’s predefined metrics. 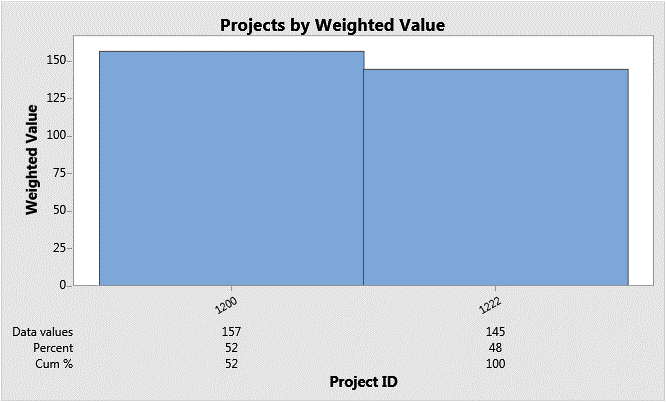 The matrix can help you determine which projects offer the most value for your effort. While the example above is only comparing two projects, you could use the matrix to compare many projects. 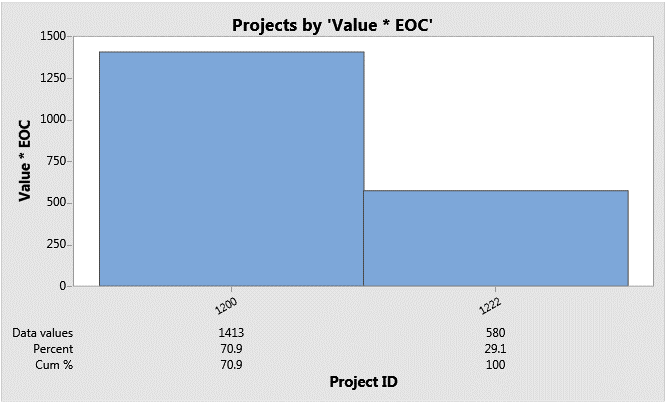 And the graphs above make it even easier (and quicker) to tell visually which projects will provide you with the most value for the least effort. As you begin your project prioritization matrix, it’s important to consider how your company will define the selection criteria, as well as the assignment of weighting factors to the criteria. If you don’t take a little time up front to work with your team to define these items, you may end up with matrix results that provide an inaccurate view of which projects are considered optimal. Best practice: for the weighting factor for your criteria, it’s typically made on a 1 to 10 scale with 1 being a negative effect and 10 being a positive effect. In the example above, selection criteria—such as financial benefits, customer satisfaction, leverage, and repeatability—were chosen. It’s probably best to have at least three selection criteria, but no more than five or six, as too many can become more difficult to manage. These examples may get your team brainstorming the criteria that will best aid in selecting the right projects for your particular initiative. How can you come up with the selection criteria? Brainstorming may work as an effective method for your team to come up with the right selection criteria for your matrix. There are several different methods you may choose for brainstorming—including idea mapping, fishbone diagrams, and CT trees. Now you can use a white board, or even just pen and paper to brainstorm, but Companion offers brainstorming templates for idea mapping, fishbone diagrams, and CT trees. What’s neat about using Companion is that the factors you enter during your brainstorming session can be drag-and-dropped and/or autofilled into other tools, reducing the need to re-enter data. What’s your secret to selecting optimal improvement projects?